Sharing meals in your home or out on the town isn’t just about eating; it’s also an opportunity to spend quality time with friends and family. But whether you are a frugal home cook or a foodie who frequents the trendiest eateries, your dining habits can impact your finances. 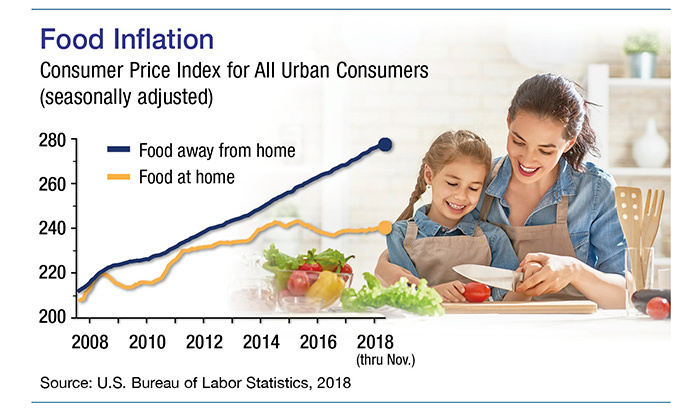 U.S. consumers spend about 13% of their incomes on food.1 Everybody needs to eat, of course, but the amount each person spends on groceries and restaurant meals is somewhat discretionary. More Americans are focusing on healthy eating these days, which is easier to control when meals are prepared at home. Here are some other factors that may be influencing these dining trends. Modern conveniences. Grocery delivery services and meal prep kits are shortcuts that help save valuable time and make it easier for busy families to put home-cooked meals on the table. Grocery shoppers can also find an expanding variety of affordable prepared (or semi-prepared) foods at the store, including staples such as roasted chickens, pre-chopped veggies, and fresh-baked breads. *Securities and insurance services offered through SagePoint Financial, Inc., A Registered Broker Dealer. Member FINRA/SIPC. David Rodriguez, Robert Bagby, Andrew Mulder, Eric Poppa, Zachary Sasser, and Jeff Brecht are Investment Advisors Representatives offering advisory services through SagePoint Financial, Inc., a registered investment advisor. This communication is strictly intended for individuals residing in the states of CO, CA, FL, LA, MD, NJ, NM, NV, NY, OK, OH, PA, and TX. No offers may be made or accepted from any resident outside the specific state(s) referenced. A Broker/dealer, investment adviser, BD agent, or IA rep may only transact business in a state if first registered, or is excluded or exempt from state broker/dealer, investment adviser, BD agent, or IA registration requirements as appropriate. Follow-up, individualized responses to persons in a state by such a firm or individual that involve either effecting or attempting to effect transactions in securities, or the rendering of personalized investment advice for compensation, will not be made without first complying with appropriate registration requirements, or an applicable exemption or exclusion. For information concerning the licensing status or disciplinary history of a broker/dealer, investment, adviser, BD agent, or IA rep, a consumer should contact his or her state securities law administrator.